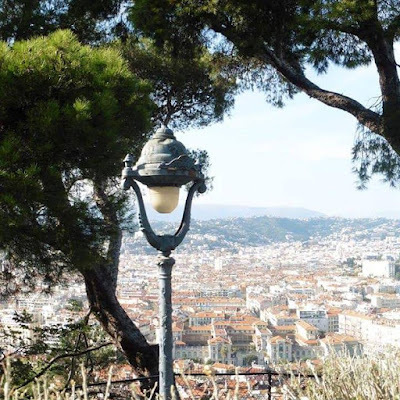 I want to do a wonderful post about my holiday in Nice and talk about the culture, the food and the stunning views, but before I can do that I feel I need to get this post out. There was one major thing that put a dampner on the whole holiday, there are many ways it could have been avoided but the main thing is that it is not what you expect staying in a 4* hotel. If you were looking for a happy holiday post this is not the one, wait for the next one. I want to note that this was purely my experience and if you have been there before you may have had a different far better one. We booked for a week to stay in Nice at a 4* hotel this was not cheap and we had saved for months for this. On check in we were straight away asked for 150 euros deposit in case we broke anything. Is this a thing? My guard instantly went up thats a lot of money to just hold on the off chance that we broke anything and we were not told about this in advance so we had not prepared for it. I would like to add even though it pains me this holiday was nearly 600 pounds each. So I thought to add that on top was absolutely ridiculous even if you would get it back at the end. Almost like you're instantly distrusted. We solved the issue thankfully one of us had a bank card and it went on that. We were then told we had been upgraded to a bigger room, not sure why just considered this was a good gesture and happily accepted. While unpacking we realised that the safe was on request (not mentioned during check in or on any of the documents.) Which is odd but we got ready to go out and mentioned we would pick up the safe key on the way back. My friend unfortunately left her money in the room, bearing in mind we had been in the hotel 3 hours, we went out for a maximum of 3 hours and this was well into the evening. We returned to the room and basically crashed as we had had a long day, it was the next morning that we realised the money had gone. I want to point out that this was not out on display for all to see it had been hidden completely behind the fridge we had in the room, so you can imagine the length they went through to search our room. We immediately notified reception and the first response we got from two seperate staff members was 'did you leave the door open' which of course no we did not. They assured us they had cameras and they could see everyone who would have entered the room. Also as the doors were key card protected they could check every key card that accessed the door. No problem then should be easy to resolve. We realised later that our room actually had two seperate doors with different numbers and key card slots. It had previously been two rooms made into one. The key card slot on the second door was active and we had no access to it. From this point on we felt incredibly unsafe. We sat down with the manager and discussed the situation and she assured us that she would solve this. However she did at times speak in French with her colleague which is rude as they assume you don't understand French. We started getting ready to go out and while doing this also realised that my friends perfume was missing. It had been a chaotic day and nothing else had seemed amiss. We decided to stay in and then got a call from the manager asking how much had been taken we told her and she hung up. Odd. Finally the girl who must have been deputy manager came to the room to tell us that no one was on the cameras, so no one could have possibly come into the room. Ironically we are not allowed to see this camera footage I think you can put two and two together here. I asked about the second door and apparently nobody has access to that door not even the staff with master cards that open every room. Yet the key card slot was active so this was clearly rubbish. We then went to police who were about as helpful as a chocolate tea pot. Filed a report and went back to the hotel. We put the do not disturb sign on the door and even pushed a table in front of it, amazingly the maid still tried to come in the room in the morning. We then rang Thomsons who we booked through but were told we would have to ring Superbreak because it was booked through them. So if they book a holiday through another company seems they have the commission and then it's not their problem. Onto Superbreak we spoke to a really nice guy who explained that we could only leave if the hotel let us leave (ridiculous rule). That we would have to take the money for the remaining few nights put it towards a new hotel and if it cost anymore pay the difference. We certainly could not afford to pay the difference and they were all coming out at around 200 pounds! Definitely out of price range. I think this rule is ridiculous we weren't moving hotels out of vanity, it was not convenient for us. Someone had gone through everything in our room and stolen things. I certainly didn't feel safe there anymore. Thankfully he found one nearby that was in budget, passed it onto his colleague as he was not in the next day to sort. She rang us the next morning to discuss options and said that the hotel are willing to let us leave (shocker). She sorted the hotel in our budget for us very efficiently no problems with that but those two comments have put me off ever booking a holiday with Superbreak. We were their customers we downgraded happily from a 4* to a 3* just to leave that place and it gave the impression they thought we were lying. Not happy! Thankfully the new hotel was absolutely lovely the staff were so helpful and the rooms were just what we needed. Even better decor than the 4* hotel in my opinion. It was abit further out of the centre but near a tram stop and the trainline. This was the Monsigny hotel and if you are going to Nice I definitely recommend it!! It should definitely be higher rated than 3 stars. After that we had a wonderful few days seeing sights and visiting different places. I will make seperate posts on that. Then it came to the taxi home Thomsons had told us if we wanted to be picked up we had to confirm online even though we had already paid for it. Surprise surprise the online site was not working. Rang the french number provided 10 times got through to no one, rang the english number was on hold for half an hour before getting through to a helpful guy who switched our hotels over and said our time would be available tomorrow. Surprise surprise still not working, had to ring the english number again (my poor phone bill) who got in contact with the french taxi company who said what our time was. I asked for that in an email to be told that 'we don't do that' I got really angry about it and they sent me an email. Extra stress not needed on a holiday. Rang Thomsons wanting to complain about this apparently it's all down to Superbreak and not them taxis included even though it was on their recommendation. May as well have booked the holiday myself save paying them commission purely for the booking of it. Two companies I won't be using again Thomsons for the disorganisation and Superbreak down to those two comments the girl we spoke to made. That was a very long rant but I felt I would not be able to write about the positives of the holiday before getting the negatives out of the way.